I started with some Bird chipboard pieces from Wycinanka. They looked like leaves to me so I decided to color them with my peacock feathers distress ink. The color went on super easy and really saturated the chipboard. I loved the color but they still looked a little plain so I doodled on them with black and white gel pens. Then I added glitter, of course. Everything is better with glitter! I thught there fluffy edges would make pretty ruffled flowers. Plus, three different sizes of clouds means three different sizes of flowers! I stamped and masked them repeatedly clockwise. Once I was done stamping I fussy cut them out and set to work with my distress ink. After they were all colored I added a bit of detail with a white gel pen before creating the centers with black enamel dots. The sentiment is from the same set. 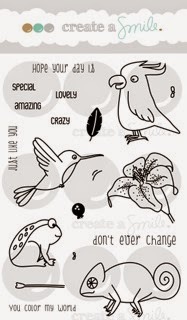 I love when you can use stamps in totally different ways! Do you see other ways to use this set? yes? Make a little something and leave us your link. We'd love to come visit you!! but instead a kind of giftbox/candybox. Hi welcome, Anja here on this monday a new start of the week and a new challenge. 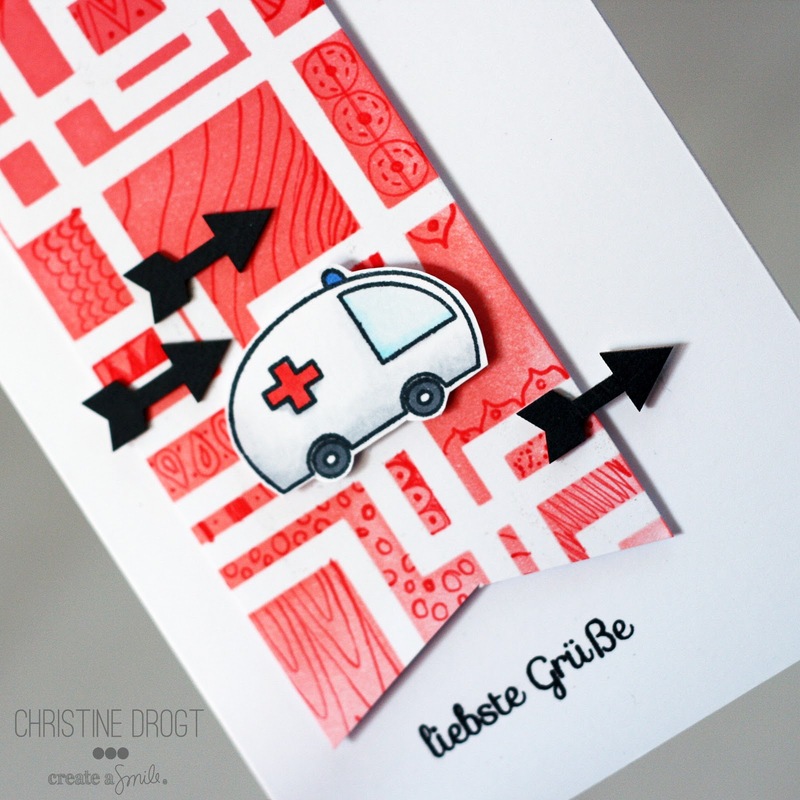 Christine challenged us to make something different then a card. So like Samantha and Anni I made a giftbox. I wanted to have some kind of peeking so I used some vellum and a stencil to create a bit of a transparant look. Used again some great Wycinanka chipboard it's a double air balloon. At the solid air balloon I put some dessin paper and the penguin from Penguin party and then placed the open balloon on top of it. 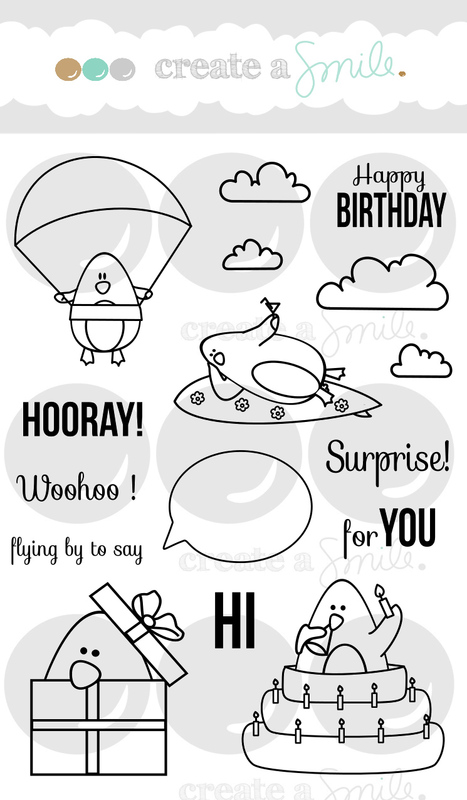 Stamped some clouds from penguin party on vellum and heat-embossed it and stamped the sentiment. To give the kite some movement I tied some twine underneath and to form the loops I used Multi medium matte. After drying it keeps it's form isn't that cool? Hope you enjoy our non cards projects so far. Do you like to make them and what do you put in it. 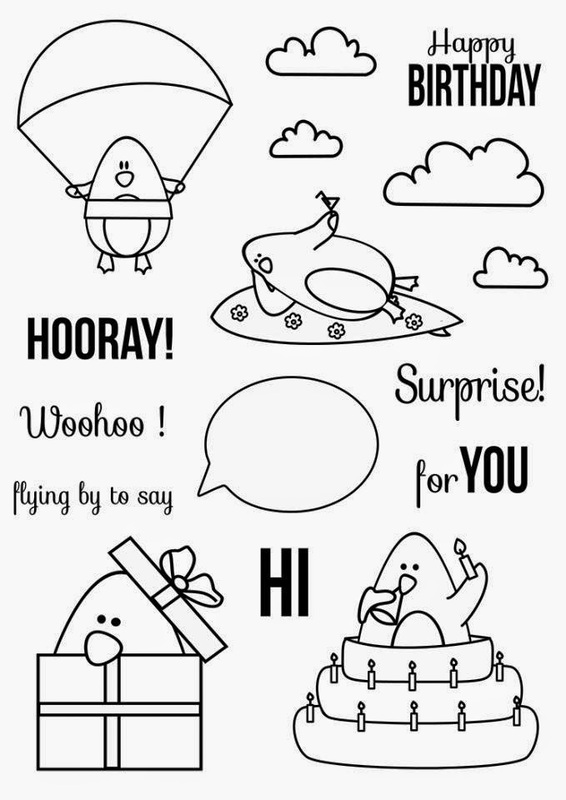 We would love to hear your suggestions or find out what other projects you would love to see or make with the create a smile stamps? Please join them. Are you having a crafty week-end? 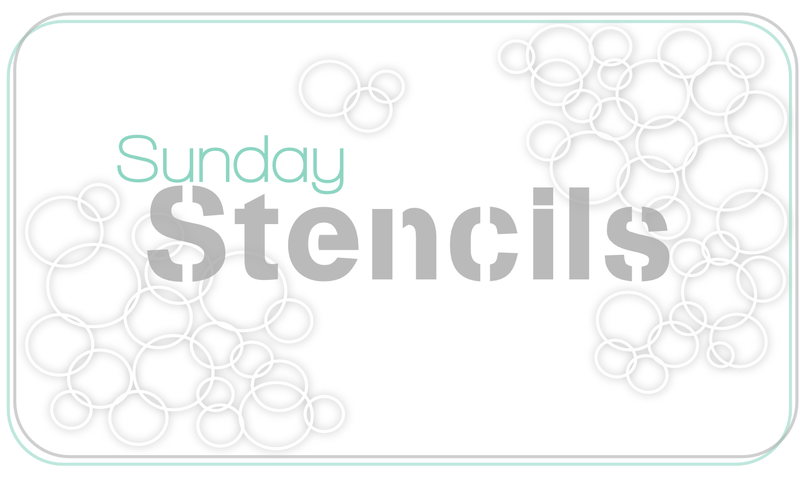 I just finished my new video - it's time for Stencil Sunday! Our shop system has been changed to ENGLISH now! Check out the awesome chipboad by Wycinanka in their shop! Thanks for stoppin' by today. Have a great sunday! ... but instead I have a small gift box for you! I wanted to share something different with you today! So I decided to put out my favorite die for a box (sadly it is not longer available). For card making I only use patterned paper from 6"x6" paper pads these days. But I still have a lot of 12"x12" papers in my stash. This die is perfect for using up my stash of patterned paper. In fact all boxes are perfect for this, I think! Which size of patterned paper do you prefer? Do you still have 12"x12" papers in your stash? Do you still use them? I tied a bow of twine on the box and on the ends I adhered arrows from Wycinanka. I glued to arrows together with the twine in between. 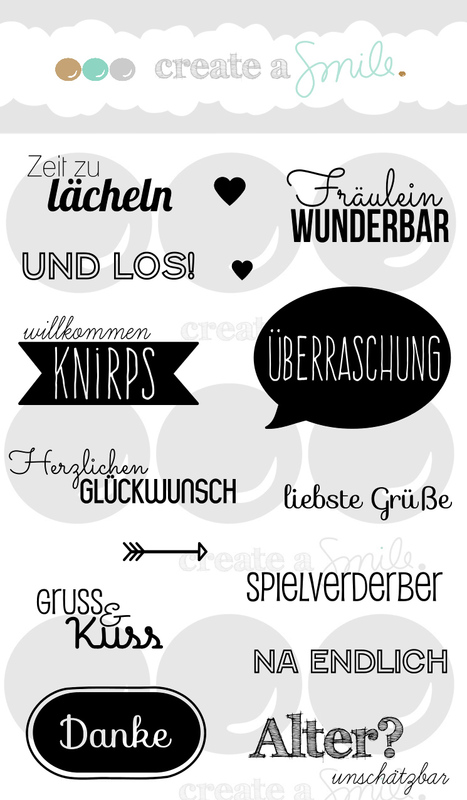 The sentiment "Und los!" from the set Für alle Fälle means something like: Ready steady go! I colored the cute little sports car from the set Whimsical Wheels with Copics and Polychromos and on the windows I added Glossy Accents to get a more realistic look. And of course Wink of Stella - because - hey, every car needs a little glitter! 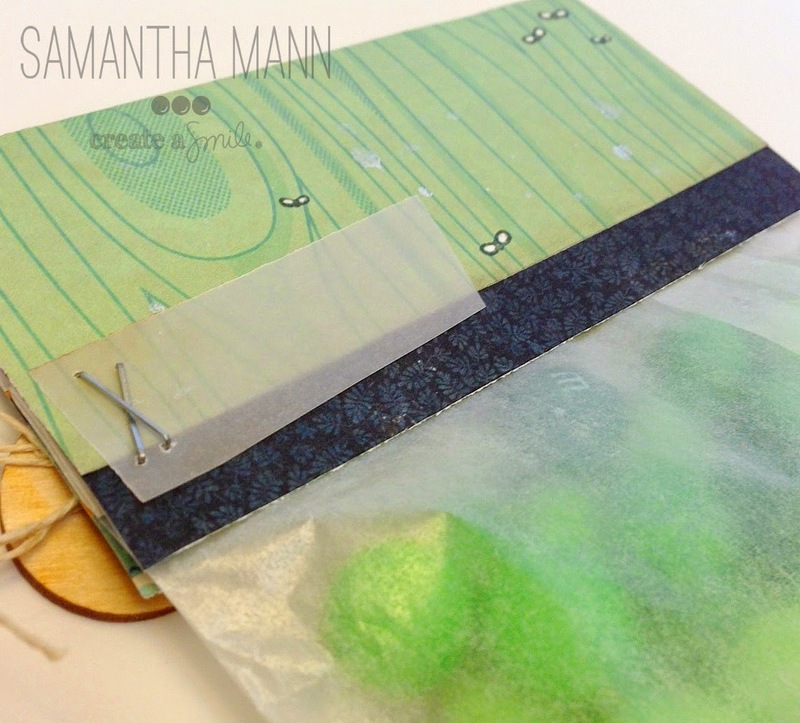 It's Samantha, and today I'm sharing with you a treat bag I made with the amazing Jungle Fever stamp set and Wycinanka products! Let's dive in, shall we? First of all, I thought, why not make a treat bag? So I watercolored up that adorable frog image with distress markers and instantly I thought of the best pun! ha ha! There it is: I lick you! It's like, 'I like you', but it's a frog with a sticky tongue! lol! AND, it's candy, so double pun fun (my favorite kind! lol!). I popped up the frog onto the teal woodgrain background and then put the tongue image under, and coated it in glossy accents. I splattered some shine spray for a little magic. 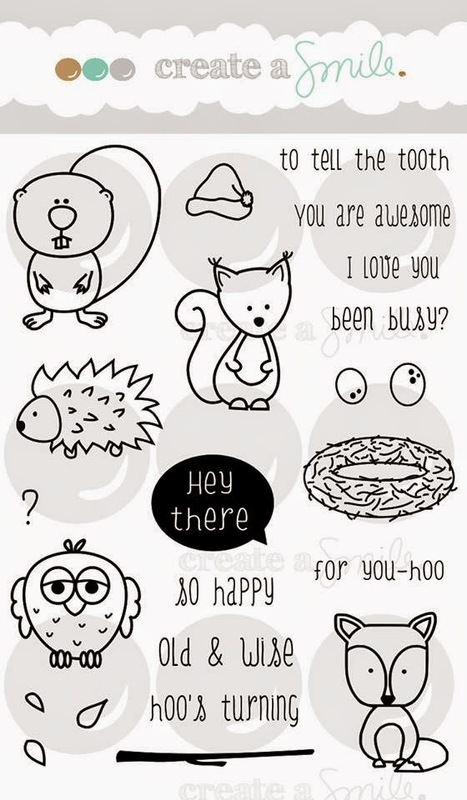 and the sentiment was created with the amazing alpha stickers that Christine made herself! I KNOW! They're awesome, and I LOVE alpha stickers! I love the wood veneer from Wycinanka to finish it off with some hemp! I was going to use a heart circle, but I thought this was a more 'masculine' treat bag, so I went with the paper clip, there are SO many options! A few flies on the back and front finished off the treat bag, and it's ready to be given and gobbled up by an unsuspecting recipient! What do you think? Do you make treat bags? Any tips for me for the next treat bag I make? Thanks for stopping by, and don't forget to look for Create a Smile Stamps on Pinterest! You will never leave there with an empty mojo cup! ha! 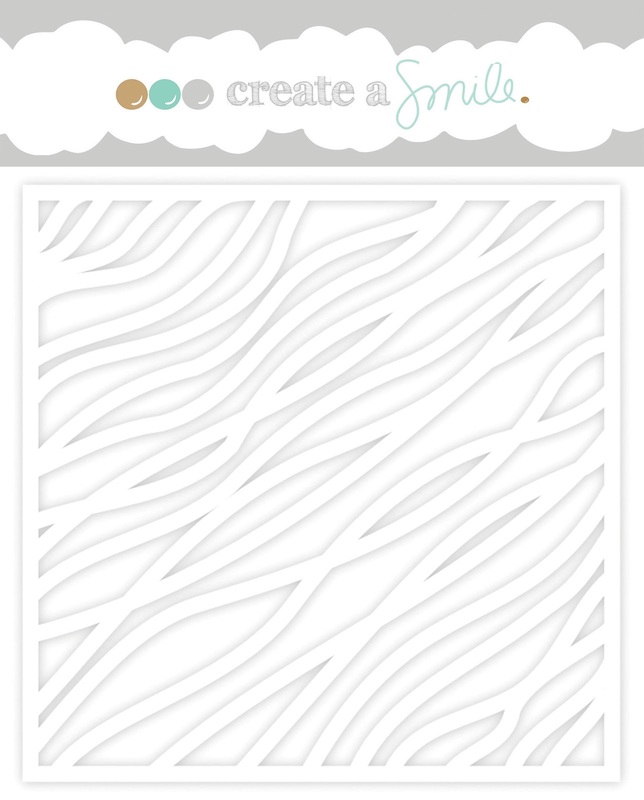 It's Linda here, with a fun card I made using the Background Wall die cut veneer, from Wycinanka as a stencil! I was trying to think of a fun way to get two (or more) cards out of the one wood veneer, and thought it would be good to use it as a stencil and then as the piece itself. Do you do that? Try to think of a way to get double the use out of one product? I needed to do some planning with the colours I chose! So I used the bricks as a stencil, first applying yellow ink, then some orange and finally a touch of red on only part of the bricks. I used a small dauber to get the best effect and the most careful ink application. Would you have used different colours? I wanted the brick wall to look like those cool industrial style ones you find in big loft apartments or on the outside of old warehouses. I coloured in the little ambulance image from Whimsical Wheels, and added a sentiment on a banner. I thought it gave some movement to the ambulance, and suggested that it was whizzing past quickly. What would you have used instead of a banner? Sometimes I'm too literal with my card making. There's a part of me that goes crazy looking at this, because why would a real-life ambulance have a banner coming out the back?! Then I remind myself that this is card making and it's OKAY to play with things a little. I'll be back next week to show you what I did with the Background Wall piece itself :) Can't show you everything all at once, can I?! The star background and the colors are so much fun! I also love the layout and how MarinA incorporated the sentiment, nearly looking as if this was another layer of the cake. Check out her video and leave her some love. And subscribe to her channel, you don't want to miss her videos! Thanks for stopping by - all your lovely comments make my/our day! How are you doing this afternoon? Better question how is your mojo? What do you do when your mojo takes a little vaca on you? Me? I go searching in blogland for a fabulous challenge to play along with and my favorites are sketches. 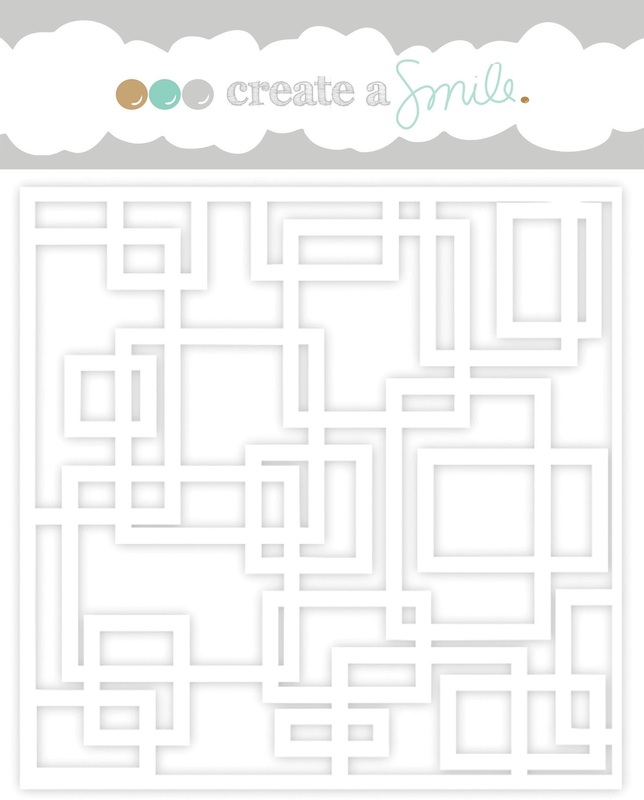 Speaking of challenges, would you like a chance to win a gift certificate to the Create A Smile Store? We are sponsoring the current challenge over at CAS on Sunday. The theme is celebrations with sequins. You still have 3 days to play along and get that gift certificate!! You can see the card I made here. 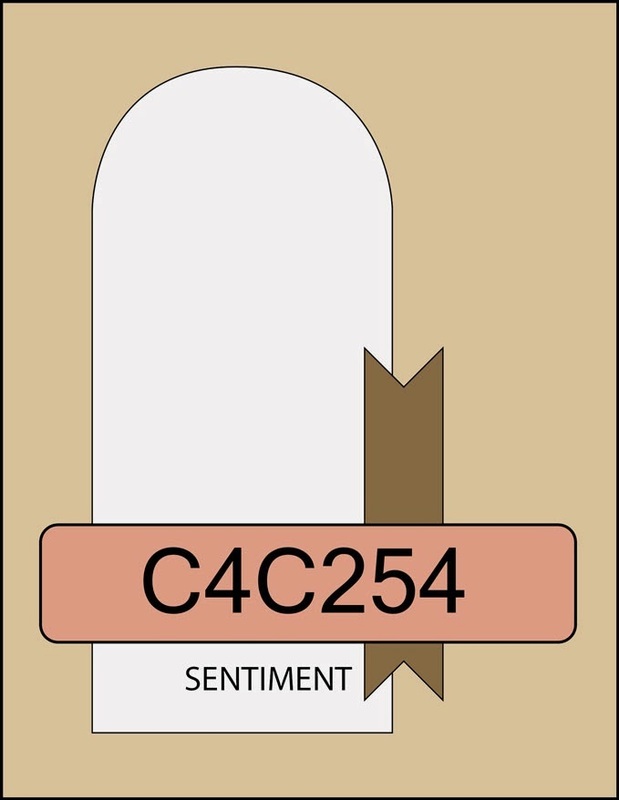 Today the card I made is using a sketch from Crazy 4 Challenges. I saw another blogger use it and fell completely in love. Thanks Leslie! Isn't that domed panel just fabulous?! I didn't have a die in that shape (although I most certainly should get one!) so I partial cut a circle die and then extended the window with my paper cutter. I created the stone background by using the Background Wall chipboard from Wycinanka. Yes, it's chipboard but I used it as a stencil. It held up just fine although I should warn you because it's thicker your embossing paste goes on much thicker. Then it requires more drying time. After it was dry I sprayed the what out of it with water and added black soot and iced spruce to get the stone look. I love the way it came out! I stamped the lily from Jungle Fever and added a stem to it before coloring with distress inks. I love adding little details to my flowers. For this one I went with the design Christine had drawn initially and just added white dots as well as dots of stickles. At this point the card starting feeling like a sympathy card to me so I went with it. I used two sentiments from Your View to create the one on my card. I masked the sunshine in the first one and inserted hugs. I decided to stamp on a pastel yellow to match my flower. I went back and forth about whether or not to cut it into a banner but ultimately decided there was so much "softness" in the card that a hard edge would be fine. A couple of enamel dots finished it off for me. I added the white panel on top of the embossing paste with dimensional adhesive. A word of warning it doesn't adhere that well. I mean, it's not going to come off but it might make your panel look a bit uneven. I had to do some adjusting. Hi there it's Anja. I hope you all had a nice weekend and maybe created something or just relaxed. 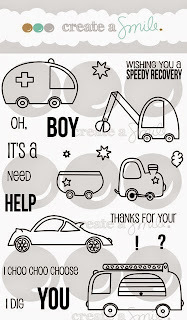 Well today I would also like to focuse on stencils, I know Christine showed you some great stencil techniques before but I would like to share with you some stencils from Wycinanka. I hope you don't mind the overload of photo's on this post because I don't have the video skills from Christine. I would like to explain the card process with pictures. On this first card I used the wall stencil from Wycinanka. I sponged some distress ink on the stencil. Sprayed water over the stencil. I placed the stencil upside down on some watercolor paper, and depped it gently with some cloth to press the ink down. This is the result you get when you lift the stencil. After drying I once again placed the stencil over the pattern and colored some white embossingpaste with distressink to obtain a stone-look. Smeared the paste over the stencil. 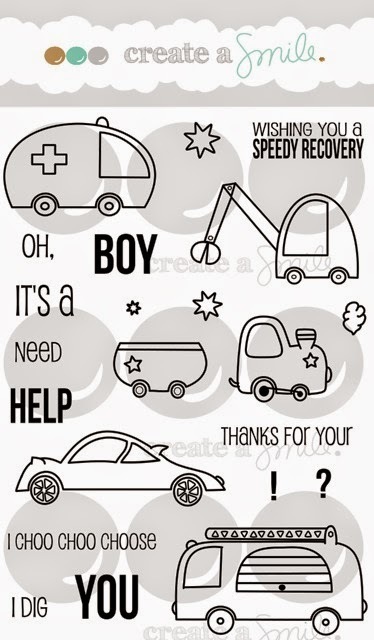 And created with the result this card. I also used some gears chipboard from Wycinanka and heat embossed it with silver embossingpowder. For the next card I did a similar technique. But instead of embossingpaste I used ink. Here I also used the gears but this time I sprayed them with ink and also used some as a mask. 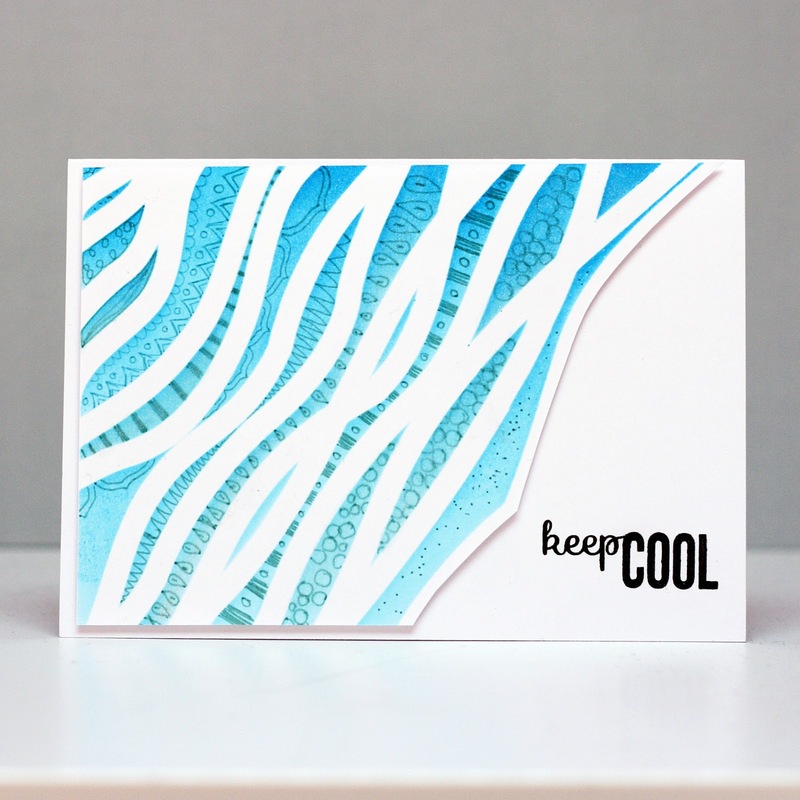 And for this last card I used translucent embossingpaste on the doodling 1 stencil. Also used a chipboard owl from wycinanka and colored it with copic markers. Hope you liked what you saw and I inspired you to use stencils and guess what ? Christine has her own stencils in store now how cool is that? So you will be seeing much more stencils in the future, love stencils, don't you? What other techniques do you use on your stenicls, please share them with us. 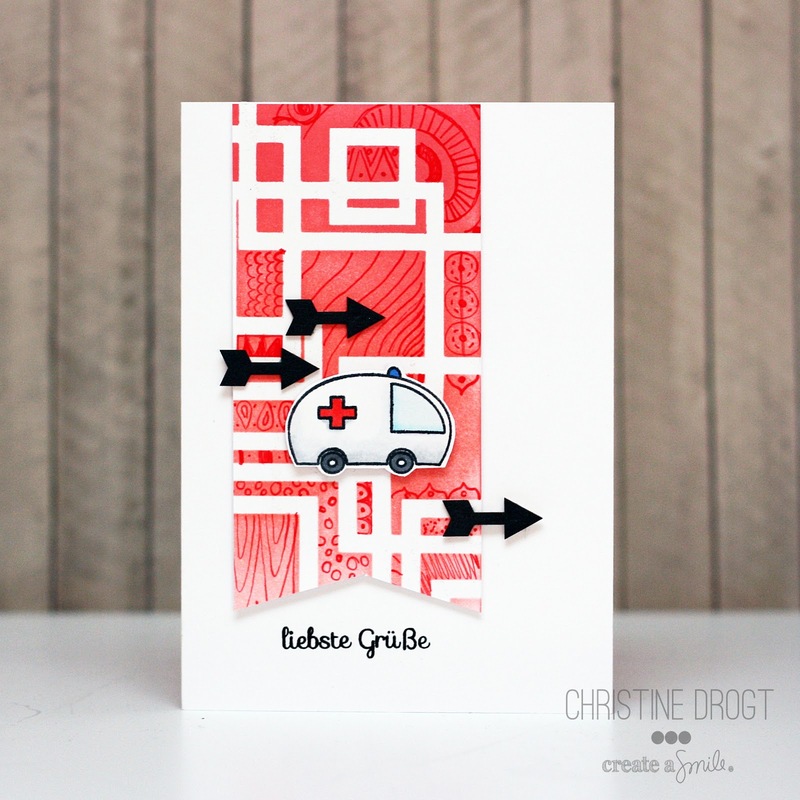 Stencil Sunday #2+ Blog Hop Winner! Post-release Video from Yana Smakula! Countdown 1: Blog Hop and a giveaway! Countdown 2: Inspiration by Anja and Linda! Watercoloring Over Stencils - Why Not?